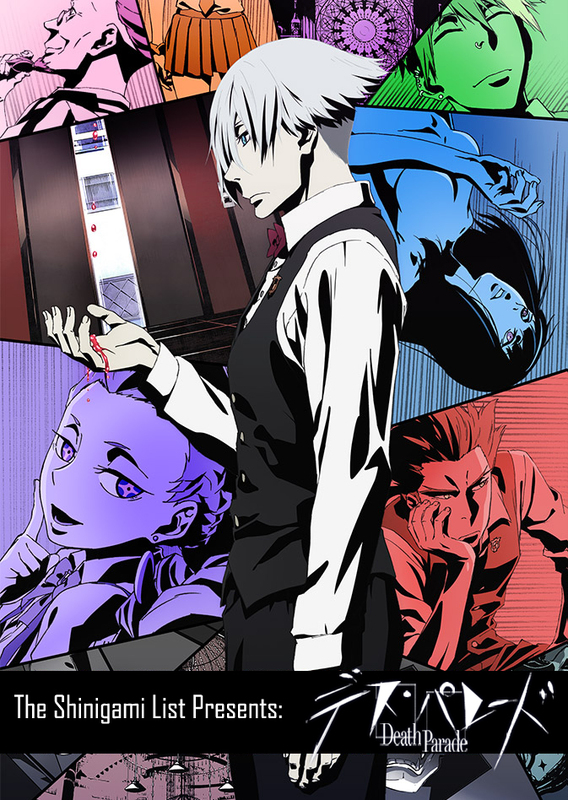 Death Parade (デス・パレード) is the new anime series by MADHOUSE animation studios. Yes, the same one that did Black Lagoon, Death Note, NANA, several Bleach and Naruto movies and many more. This new anime is an original show by the animation studio. It is also a retelling of the Death Billiards short movie from 2013. 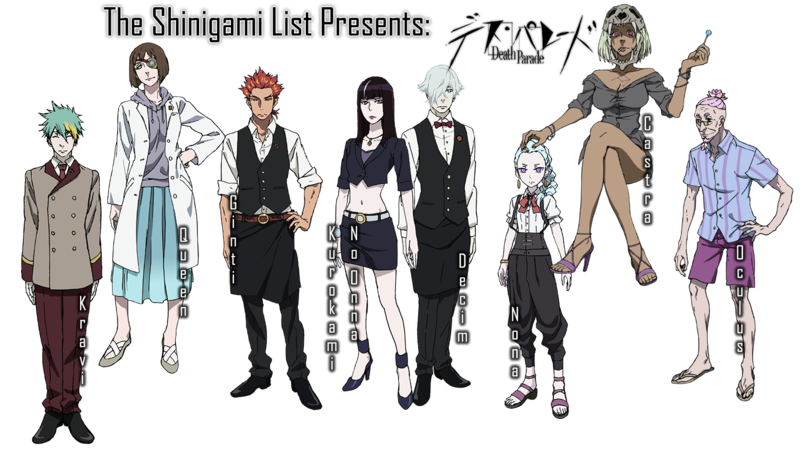 Do not forget to check out Death Parade when it airs – 9th January 2015! It will be streamed, too! Nico Nico and Hulu will do this for all who want to watch online. Death Parade will focus on the events that happen within the walls of the weird place called “Bar Queen de Kim”. These are odd and dangerous events, involving mainly the bar’s guests, but set-up by the bar owners and staff. The first episode will tell us about a couple of newcomers. Takashi and his companion will have to pass the challenges presented to them by the Queen de Kim bar staff and especially the bartender Decim. Dread, pain and suffering will follow, but what will happen if they endure the dangerous cocktail? Asami Seto as Kurokami no Onna, who was also supposed to be a part of the staff in the bar. Her appetite is remarkable, but is also interested in the stories that come alongside the cutomers. Tomoaki Maeno as Decim (floor 15), the bartender who always speaks in a detached tone, makes top-notch cocktails and is optimally welcoming to all customers. Kouki Uchiyama as Kravi, the elevator boy who helps connect everything. Always smiling and in good moods; often joking with Ginti. Rumi Ookubo as Nona (floor 90), a very intelligent and experienced staff member who knows much more than her appearance would suggest. Ryoka Yuzuki as Castra, the woman who takes care of the death coefficient and the bar’s destination points. She has a huge sweet tooth and is always munching on something sugary. Ryoko Shiraishi as Queen, the woman who was originally also a clerk, but is not the information bureau woman. She loves to drink and enjoy her free time. Often seen chatting with Nona. Tesshou Genda as Oculus, the man who is the closest to the chief. He is well-respected, although his odd ways. Yoshimasa Hosoya as Ginti (floor 20), rough around the edges and with bad manners; nonetheless, this is also a part of his management job. Very promising anime. Just saw Death Billiards to make sure I will like it and now I am hooked. More Death Billiards? Please yes! This show was underrated and very, very good. Yep, watched it as well – just one episode but it was too good. Thank you for this preview – I am rather surprised I have not heard of it before! As BrutalMurder-kun said, the anime is quite underrated and unpopular. I would suggest you watch it. As a shinigami, I myself was quite interested in the plot and found it nice. Some seriously awesome characters here!